When it came to weaning my first child I had actually never heard of baby led weaning (blw). As she was approaching 6 months old I planned for weaning by buying a blender/steamer, purée freezer pots, an Annabel Karmel weaning book, bowls, spoons and bibs along with making and freezing all my own purees. When we started weaning she took to it really well and was progressing with lots of different flavours until unexpectedly in the second week she completely refused. I tried lots of different things without success until we tried baby led weaning. It was amazing, she started eating again and the progression was truly phenomenal. So when it came to weaning the second and third time around there was no hesitation with what method I would be using. When it comes to baby led weaning there are a few things to consider before starting. Here in the UK the official advice is to introduce solid foods from around 6 months old. There are a few things that can help you decide whether your baby is ready. Whether your baby has teeth or not does not actually effect their ability to chew on food as their gums are pretty strong. 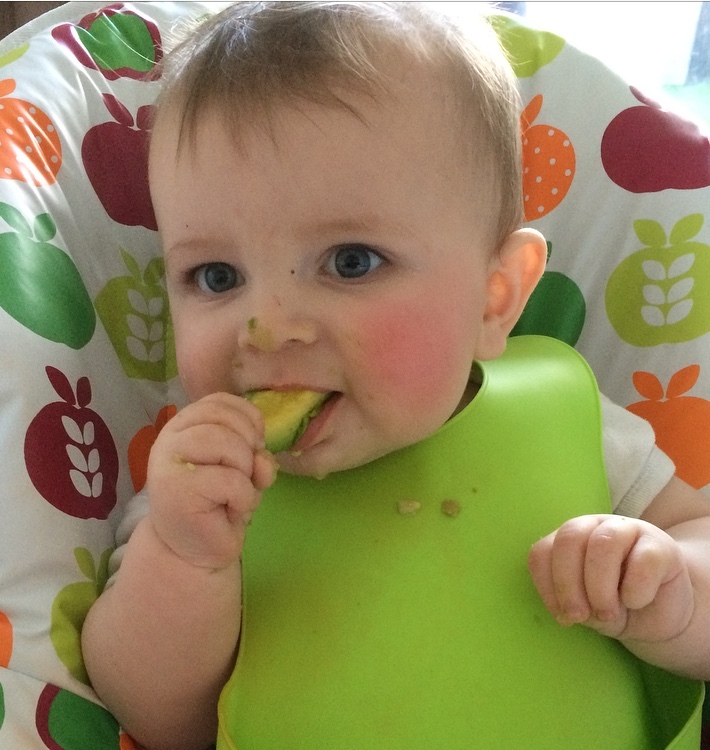 One of the main concerns parents have with baby led weaning is to do with choking. Choking and gagging are two different things. Gagging is when a child's gag reflex has been triggered resulting in retching. Retching occurs because a child's gag reflex is located closer to the front of their mouth compared to an adult, as you get older it moves further back in your mouth. Choking is when your child's airway is blocked partially or completely. If their airway is partially blocked you may see them cough to try and clear it. When their airway is completely blocked there will be no noise as no air can get in. It is always a good idea to know what to do if your child is choking. Please click here to read the official advice from the NHS. Never leave your child unsupervised while they are eating. When it comes to equipment you don't really need anything other than you, your baby and some food but I would definitely recommend a high chair. Other helpful items include a mess mat for the floor, a rubber scoop bib and a sippy cup. At around 6 months, babies mostly grasp things with their whole hand in a clenched fist which means that the food you offer has to be something that they can hold onto. Food needs to be chunky enough for them to hold onto but should not fall apart in their fist, ideally finger sized. Bear in mind that food shouldn't be too hard as this could be a potential choking hazard. Only offer your baby food that you are comfortable with. When cooking fruit and vegetables I would recommend using a steamer with first foods as steaming vegetables keeps all the vitamins and minerals in opposed to boiling or microwaving. Also steaming vegetables ensures they are perfectly cooked and flavourful. Round fruits - Fruits such as grapes, cherry tomatoes and large blueberries are all potential choking hazards. These should always be cut in half lengthways or quartered. Stoned fruits - should be ripe and stones removed. Raw foods - raw fruits and vegetables such as carrots and apples are too hard for babies. They need to be softened first. Fish - ensure all bones are removed. Stay clear of high mercury fish including shark, swordfish and marlin. Oily fish - NHS guidelines advise that boys have no more than four portions a week and girls no more than two portions a week. Meat - ensure all meat is thoroughly cooked and all bones are removed. Here in the UK the Department of Health recommends that children under 1 have no more than 1 gram of salt a day. So considering the average slice of bread has 0.4g of salt per slice it soon adds up. Obviously fast food, processed meals, jars and tins usually have high salt contents so shouldn't be offered to your baby where possible. Also, it's worth keeping an eye out on sugar content. Sugar does not contain any nutritional value at all so really does not need to be offered to your baby. It will only make things harder in the long run! Use naturally occurring sweet fruits and vegetables and avoid refined sugar where possible. Every baby will progress with solids at their own pace and it's important to not get hung up on what your baby actually manages to eat. When starting weaning it's important to remember that this is a huge milestone and not every baby will want to undertake it so willingly. Your baby's first experience of food is all about exploring the different textures, colours and smells. If they actually manage to put it to their mouth and have a taste then that's great but don't worry if they don't. Your baby will decide how much they want to have and will naturally stop eating when they are full. Finding the right time of the day is also something to consider when you start weaning. You want your baby to be awake and happy, not too full from a milk feed but equally not too hungry for milk. Avoid starting if your baby is poorly or you have a lot of change coming up. 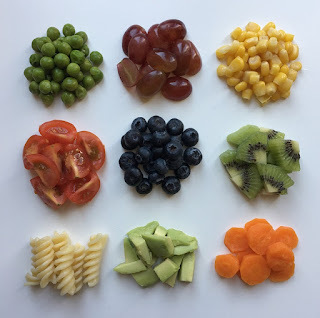 Once they have mastered the basics of the chunky first foods you can then start offering them a variety of foods with varied textures and sizes that will test their capabilities. You can introduce them to spaghetti, rice, mince, noodles, risotto, mashed potato and couscous. Don't worry if your baby doesn't actually manage to eat anything it's all part of the learning process. A word of warning though, be prepared for mess!! You can start to offer smaller things like sweetcorn and peas that will test their pincer grip. The pincer grip is where babies pick up items with their thumb and forefinger. This is normally established between 8 to 12 months but every baby is different. Your baby may still grab these items in a fist to begin with but practice will make perfect. 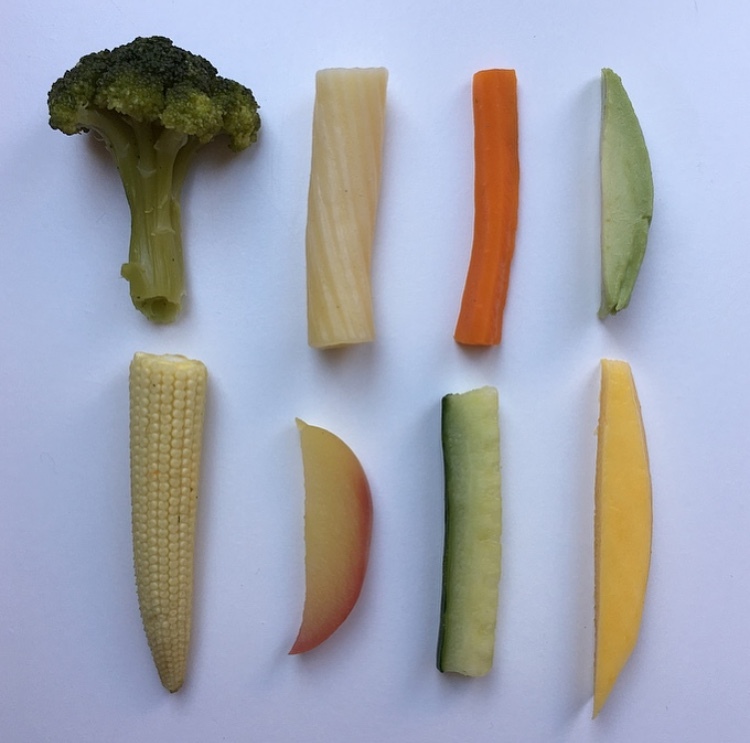 You could also try cutting previously chunky sized fruit and veg into smaller pieces but always be wary the size, you want it to be no bigger than a grape cut length ways. When feeding your baby try to offer them a varied diet. The more exposure to different foods at a young age should result in a much less fussy eater when they are older. As your baby progresses with weaning you may find that they want less milk. Some children will drop feeds while others will still want their milk in between eating. If your child drops their milk intake then you may want to increase the amount of dairy they are having. Always speak to a healthcare professional if you are in doubt. 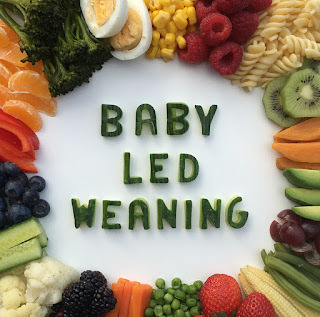 For more information on baby led weaning I would highly recommend The Baby-led Weaning Cookbook by Gill Rapley and Tracey Murkett as not only does it contain some fantastic recipes it also gives you information on baby led weaning. Disclaimer - This information is to be used as a guide. I am not a healthcare professional, I am simply a mum passing on her experience of baby led weaning. If there is anything you are unsure about please do seek professional advice.